QualTrace III is an integral part of PeakTrace 6 and can be used as either part of the standard PeakTrace basecalling, or on its own via selecting qualtrace as the basecaller within Auto PeakTrace 6. The QualTrace III options allow the default QualTrace III processing options to be adjusted as well as allowing the detail level of the Trace Reports to be set. The setting on this menu allow the user to override the default settings for QualTrace. For most of these options it is strongly advised to not change these settings (other than the trace report setting) as the maximum utility is obtained with QualTrace when using consistent values allow historical comparisons to be made. This can enable drift in protocols or regent decay to be detected early. In addition, using inappropriate values may result in invalid analysis results. The percentage delay of the actual first peak from the expected for the trace to be classified as Late Peak Start. Default is 133%. The percentage of spectral crosstalk (bleed of signal from one channel into other channels) due to mis-calibration of DNA sequencing instrument for a trace to be classified as Spectral Calibration. Default is 15%. The approximate base from which signal to noise measurements are made to determine if a trace falls into the Excellent, Good, Below average, Poor, or Failed categories. Default is 700. The signal to noise ratio used to determine if a trace falls into the Excellent, Good, Below average, Poor, or Failed categories. Default is 4. The base (to the mid signal base) from which the early signal to noise ratio (EARLY SIGNAL) is determined. Default is 0. The base (to the late signal base) from which the mid signal to noise ratio (MID SIGNAL) is determined. Default is 450. The base (to the end of the basecall) from which the late signal to noise ratio (LATE SIGNAL) is determined. Default is 900. The measured peak width over the expected width at the set poor resolution base to classify a trace as Poor Resolution. Default is 300% and base 700. The minimum quality score used to calculate GOOD BASE. Default is 20. The minimum quality score threshold and window size used to calculate CRL. Default is 20 and 20. The percentage height of the second peak beneath the primary peak required to classify a peak as mixed signal. Default is 50%. The percentage of mix peaks is the mixed base window to classify a trace as Early Mixed or Late Mixed. Default is 40%. The start base of the early mixed base region. Default is 50. The end base of the early mixed base region. Default 250. The start base of the late mixed base region. Default is 500. The end base of late mixed base region. Default is 700. The percentage height that a narrow peak with strong signal in all 4 channels must be above the average peak height to detect the presence of air bubbles (BUBBLE). Default is 200%. The percentage height that a broad peak with strong signal in all 4 channels must be above the average peak height for the void peak base (VOID PEAK) to be calculated. Default is 300%. This option controls the detail of trace report. The four options are no report, brief, standard and full. Default is no report. This option controls if a qualtrace log file is generated. The tab delimited logfile is saved to the output folder with the name “qualtrace.xls”. Default is checked (QualTrace log file output). QualTrace III output information of 55 trace parameters covering a wide range of run conditions and trace quality. The categories reported are. A numerical classification of the trace by QualTrace III. Most codes are shared with PeakTrace with the following additional codes. The raw channel signal falls after the signal2noise threshold (default 4) after the signal2noise base (default 700) plus 250. Peak signal strength is not the limiting factor for trace read length. Production protocols should be optimized to achieve this results. Alignable Q20+ bases are typically high to very high. The raw channel signal falls after the signal2noise threshold (default 4) after the signal2noise base (default 700), but before signal2noise base plus 250. Peak signal strength is the limiting factor for trace read length. Alignable Q20+ bases are typically high. The data collection stops before the raw channel signal falls below the signal2noise threshold (default 4). The read length is limited because the run was stopped too soon. This problem can be solved by increasing the run time. The raw channel signal falls below the signal2noise threshold (default 4) before the signal2noise base (default 700), but after signal2noise base minus 400. Peak signal strength is a major limiting factor for trace read length. Contamination with salts, detergents, proteins, RNA, or excessive DNA. Alignable Q20+ bases are typically low to moderate. Alignable Q20+ bases are low. Loss of sample during clean up. Heavy contamination of the template DNA with salt or other charged ions. Alignable Q20+ bases are very low to zero. Trace file appears to be derived from a PCR product that results in the peak signal ending. The read length is limited by the length of the PCR product. Alignable Q20+ bases are variable as they depend on the length of the PCR product. Contamination of the template with a short PCR product from PCR primer mis-annealing. Single primer PCR amplification in the sequencing reaction. Alignable Q20+ bases are typically moderate to high. Two different DNA templates present in the sequencing reaction. Alignable Q20+ bases are low or moderate. The first signal peak collection has been time delayed by 33% compared to the expected collection time for this trace run condition. This error can occur when the capillary is overloaded with protein, template DNA, or salt. Alignable Q20+ bases are moderate to high. Indicates that the trace file contains significant fluorescent dye channel signal crosstalk (a minimum of 15% in at least one channel). Multiple occurrences of this result for an individual DNA sequencer or capillary suggest that a machine spectral calibration should be performed. Alignable Q20+ bases are moderate to high depending on the severity of the signal cross talk. Failed arrays that need to be cleaned or replaced. Contamination with salts, detergents, proteins, RNA, or non-template DNA. Alignable Q20+ bases are moderate to low. The time and date the QualTrace III analysis was performed. Name of the trace file. The name of the DNA sequencing instrument the trace was collected on as recorded in the .ab1 field MCHN. The name of the run module the trace was collected using as recorded in the .ab1 field MODF. The run name on as recorded in the .ab1 field RunN. Date and time the trace file was collected. The basecaller and version number used to basecall the trace file as recorded in the .ab1 field SVER. The array capillary number the trace was collected using as recorded in the .ab1 field LANE. The length of the capillary array in cm as recorded in the .ab1 field LNTD. The polymer lot used as recorded in the .ab1 field SMLt. The name of the tray the sample was loaded from as recorded in the .ab1 field CTNM. The tray well the sample was loaded from as recorded in the .ab1 field TUBE. The sample id as recorded in the .ab1 field LIMS. The sample name as recorded in the .ab1 field SMPL. The sample comment as recorded in the .ab1 field CMNT. The owner of the sample as recorded in the .ab1 field CTOw. The DNA sequencing instrument operator as recorded in the .ab1 field User. The buffer tray temperature as set in the ABI Data Collection software in degrees C.
The detector cell temperature as set in the ABI Data Collection software in degrees C.
The run temperature as set in the ABI Data Collection software in degrees C.
The run voltage as set in the ABI Data Collection software in kV. The scan rate as set in the ABI Data Collection software. Values indicate time between scans in seconds. The laser power setting as recorded in the .ab1 field LsrP in microWatts. Median voltage as observed during the run in kV. Median current as observed during the run in milliAmps. Median power as observed during the run in milliWatts. Median temperature as observed during the run in degrees C.
The injection voltage used in kV. The injection time in seconds. The inter peak spacing as recorded in the .ab1 field SPAC. The time of data collection in seconds. The number of scans collected as recorded in the .ab1 field SCAN. The number of data points in the raw channels that exceed 32000. Values about 0 indicate that too much DNA was loaded. The average quality score of the trace within the CRL. This score is analogous to sample score provided by the ABI Sequence Analysis Report Manager. The Contiguous Range Length (CRL) is the longest uninterrupted stretch of bases with an average quality score higher than the contiguous readlength quality value (default 20) using the contiguous readlength sliding window (default 20). This score is analogous to LOR value provided by the ABI Sequence Analysis Report Manager. The average noise value across all four raw data channels. The crosstalk signal in the channel showing the greatest level of signal crosstalk (i.e. cross signal in one channel due to strong signal in another channel). Values above 0.1 indicate that a spectral calibration should be performed on the instrument. The ratio of the largest potential “dye blob” peak to the average sequencing peak signal. Values greater than 1 are indicative of the presence of dye blobs. Values above 4 indicate major dye blob peaks are present. The number of narrow peaks (spikes) with signal in all 4 raw channels where the spike is greater than the bubble spike threshold (default 200%) more than the median peak signal height. Bubble spikes result from small gas bubbles in the polymer moving past the detector. The number of late peaks with the signal in all four channels is void peak threshold more than the median signal. Values above 0 indicate the trace collection time was excessive for the run voltage and polymer used. The scan number of the first sequence peak as recorded in the .ab1 field B1Pt. The signal-to-noise ratio of the first region between the early signal base (default 0) and the mid signal base (default 450) of the raw data channels. The signal-to-noise ratio of the second region between the mid signal base (default 450) and the late signal base (default 900) of the raw data channels. The signal-to-noise ratio of the third region between the late signal base (default 900) and the last data point of the raw data channels. The approximate base number where the trace signal-to-noise ratio falls below the signal2noise threshold (default 4). The quality score threshold for a high quality base as set by the quality threshold value (default 20). Indicates if the trace contains an insertion or deletion. A value of 0 indicates no indel detected, any number above 0 indicates the approximate base position of the suspected first indel. The total number of basecalled nucleotides in the trace file. The total number of basecalls with quality scores greater than or equal to the quality threshold. The ratio of those primary peaks which have an underlying secondary peak of more than the mixed peak threshold (default 50%) of the height primary peak to the total number of primary peaks in the region from early mixed base start (default 50) to early mixed base end (default 250). Values above 0.1 are indicative of mixed signal in the early region of the trace. The ratio of those primary peaks which have an underlying secondary peak of more than the mixed peak threshold (default 50%) of the height primary peak to the total number of primary peaks in the region from late mixed base start (default 500) to late mixed base end (default 700). Values above 0.1 are indicative of mixed signal in the late region of the trace. The width of the peak at the poor resolution base (default 700) at half the peak height. The larger this value the lower the peak resolution is for a given run condition. Large values relatively to the SPACING value indicate low quality traces with poor peaks resolution. Indicates that the QualTrace III license has expired. Please contact Nucleics to obtain a license upgrade. QualTrace III can also generate text based Trace Report files. This files can be supplied to end users to explain to them why their trace is not the quality they are expecting and what they might do to correct the problem(s). The report files can be generated with increase levels of report detail depending on end user needs. The report files are named after the trace file with “_report.txt” added (e.g. if the trace file name is “trace123.ab1” then the trace report file will be named “trace123_report.txt”) and saved to the same folder as the output trace file. 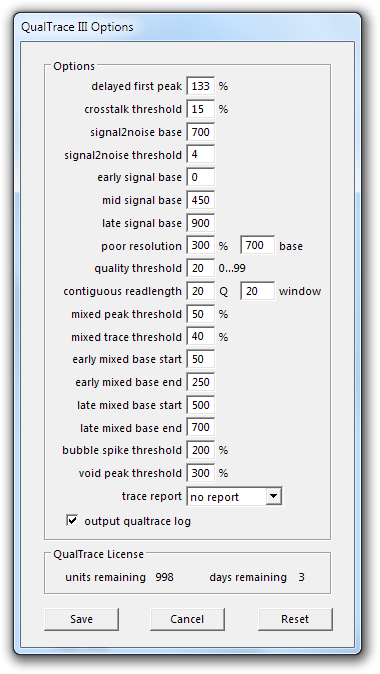 This option prevents the output of a trace report. This is the default value. Outputs a short description of the most important QualTrace III analysis results. An example is shown below. Outputs a summary and detailed description of the important QualTrace III analysis results. An example is shown below. Outputs the summary and full details of the QualTrace III analysis in text form including the PeakTrace and QualTrace III settings used for the analysis. An example is shown below.